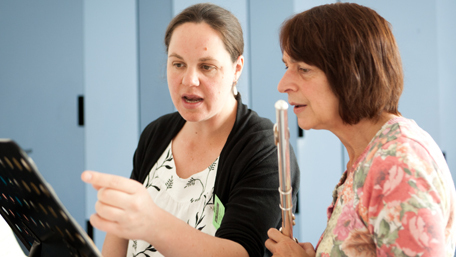 Philippa Davies and Jan Willem Nelleke return in 2019 to lead another popular Flute Summer School. Philippa is known world-wide as one of the finest solo and chamber flautists currently performing and plays in the Nash Ensemble, London Winds, London Sinfonietta as well as teaching at the Guildhall. This is a well-established friendly but demanding summer school for advanced students - post Grade 8/Conservatoire entry level - with the aim of increasing musical freedom, imagination, awareness and expression in solo, chamber and orchestral repertoire. Every aspect of technique will be worked upon in order to free up musical expression with particular attention paid to tone, articulation, breathing, improvisation skills and how freely the body moves to improve performance - Philippa is a licensed Andover Educator in Body Mapping. Please prepare three or four varied pieces. A ticket is included to the public concert given by Philippa and Jan Willem on Wednesday 7 August. This year we will also spend some time working closely with the singers on the concurrent course. There will be a combined masterclass on the Thursday evening taken by Philippa and singer tutor Sarah Leonard and a joint informal concert by course members on the last afternoon. Don't forget the 25% discount (excluding room supplements) for under 27s.